Unbeaten Olympic champion Anthony Joshua will face Gary Cornish for the vacant Commonwealth heavyweight title. The 25-year-old will meet the Scotsman on 12 September at the O2 Arena in London, bidding to increase a record of 13-0, all by way of knockout. Cornish, 28, is the unbeaten IBO Intercontinental champion and has won 12 of his 21 fights by knockout. 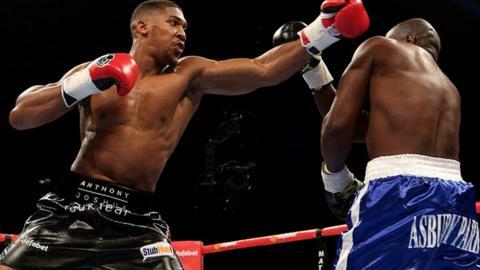 Joshua became the first man to stop Kevin Johnson in May, dispatching the American in less than two rounds. Watford-born Joshua won the super-heavyweight gold medal at London 2012, and has yet to be taken beyond the third round in any of his 13 professional fights. He is set to fight Dillian Whyte, who he lost to as an amateur, for the British heavyweight title in November or December. Cornish last fought in May, stopping Hungarian Zoltan Csala in the fourth round. On the undercard Dave Ryan and John Wayne Hibbert meet for the third time after Ryan claimed a ninth-round win when the pair met at the same venue two months ago for the Commonwealth light-welterweight title. They first fought in March 2013, when Ryan edged a controversial decision.